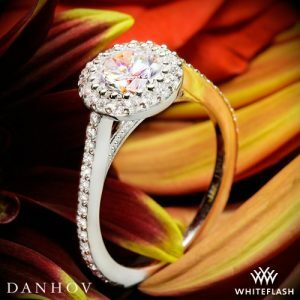 Danhov is an award-winning designer of unique, handcrafted engagement rings, wedding bands, and fine jewelry. The brand is known around the world for its innovative design philosophy and impressive designs. 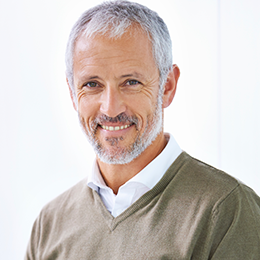 Calling upon their skill and experience, they ensure that every Danhov customer wears a special engagement ring or wedding band that is an extension and personal statement of their discerning taste. Danhov was founded in 1984 by Jack Hovespain. Having spent many years shadowing his father, an accomplished fashion designer, Jack spent his formative years exposed to trend-setting haute capture and leaned at an early age how to marry precision with art. Today, this influence drives Jack’s passion to design each ring with exact measures and attention to detail, in order to create the world’s most exquisite collection of bridal jewelry. Today, the brand has built a strong reputation for their unique, hand-crafted designs. In 2011 they received the JCK Jeweler’s Choice Award for their Abbraccio Collection and they were also awarded first place in the 2015 Platinum Innovation Awards. Given Hovespain’s haute couture background, it perhaps isn’t surprising that the brand has become associated with innovation and trend-setting design. Each and every Danhov ring is hand-made and adorned with intricate details, meaning that each one is unique. What’s more, because the rings are handmade, it opens up a whole world of creativity that simply can not be achieved with the traditional cast molding method of making rings. Danhov specialize in custom orders, allowing you to customize a piece to meet your exact needs and requirements. 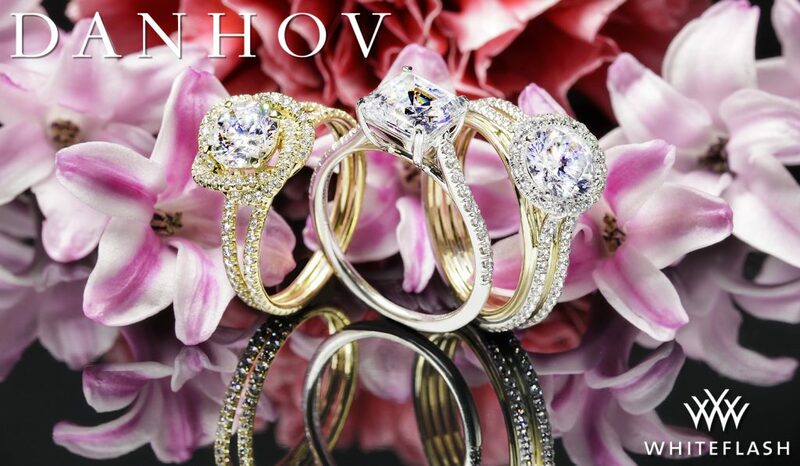 Danhov ‘s engagement rings are known for their high precision and individuality. Each and every ring in their collection has been handcrafted or hand-assembled at their Hollywood offices. Unlike the vast majority of contemporary Jewelers, the brand doesn’t use any molds or mass-production assembly lines – so you can be sure that each ring is of the highest quality and delivers exceptional attention to detail. The company’s production process is also relatively eco-friendly, as they avoid the use of harsh chemicals and large machinery that are often used in the traditional molding and manufacturing process. 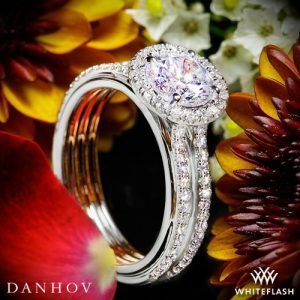 Tip: You can purchase Danhov Engagement rings at Whiteflash or James Allen online and Savvy and Sand if you’re based in the UK. If you’re looking for High Quality Super Ideal Cut Diamonds I would recommend looking at Whiteflash’s A Cut Above Diamonds. 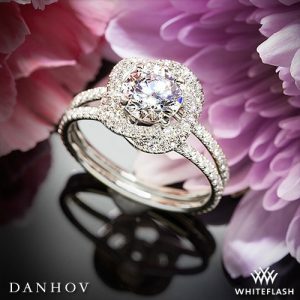 Danhov offer a wide range of engagement rings to choose from, with 11 signature collections. 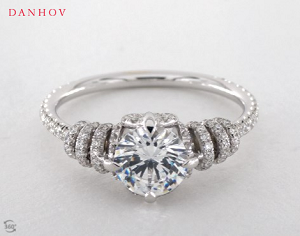 And one thing’s for sure, high quality craftsmanship is at the very heart of all of Danhov’s rings. All of their collections are distinguishable by their seamless mounts, understated detailing, and creative, interlocking shapes. For more information about this ring, click here. The unique engagement rings in this collection are all handmade and are designed to express the essence of love’s perfect embrace. Featuring the unmistakable Danhov swirl, formed around a single wire, each design creates a seamless transition between the band and the centre stone. Paying homage to the classic engagement ring, this timeless collection offers a number of unique variations on the traditional solitaire style. Contemporary and elegant, this striking collection features diamonds suspended by unique micro-prongs, which ensure that the centre gemstone is firmly in the limelight. With their striking designs and abundance of glistening diamonds, the rings in Danhov’s unique Couture Collection are nothing short of red-carpet-worthy. 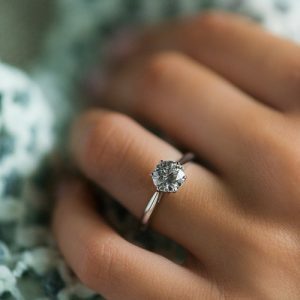 Elegant and timeless, the handcrafted engagement rings in the Eleganza Collection are designed to accentuate the centre diamond and command attention. Symbolising the strength and support of a strong marriage, the designs in the Per Lei collection feature an inverted arc, which holds the diamond and optimises its sparkle and shine – representing the unrivalled glow of a woman in love. Taking inspiration from the natural world, the rings in the vintage-inspired Petalo collection symbolise a man and woman uniting, as they become a pair more beautiful than their individual parts. This skilfully handcrafted collection finds the perfect balance between boldness and beauty, featuring solitaire diamonds set upon yellow, rose, or white gold, or platinum rings in a variety of ever-popular styles. Embracing graphic shapes and circles of eternal love, this distinctive collection has been designed to convey the unity and strength of marriage. With their double-wire shranks that hold each other and together present a beautiful centre diamond, the designs in the Unito collection symbolise the vow to have and hold for eternity. This collection is sleek and minimalistic, yet unquestionably high-voltage. With no prongs or bezels, these tension engagement rings hold their diamonds in place with pressure alone. 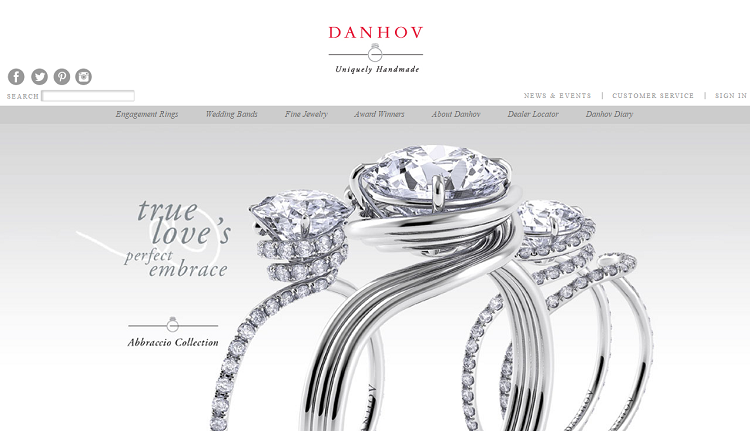 You can explore the full Danhov Engagement line here. 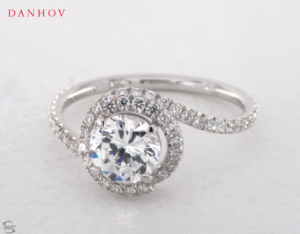 Where can I buy Danhov engagement rings? 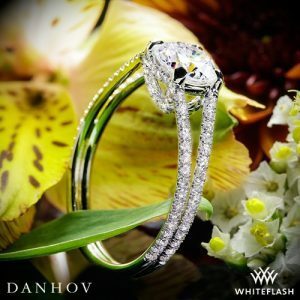 Although Danhov does not sell directly to the public, their engagement rings can be found in a number of Authorized Danhov Retailers across the US, as well as online of course. 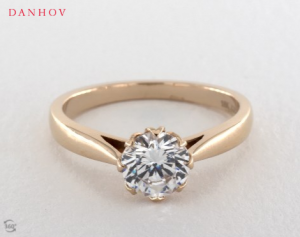 If you’re thinking of investing in a Danhov engagement ring, it’s vital that buy it from a genuine seller. 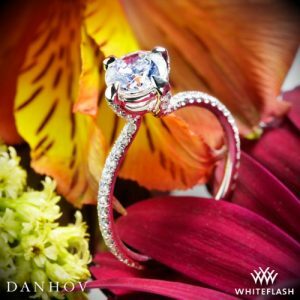 Both Whiteflash and James Allen are both Authorized Danhov Engagement Rings retailers, so we’d recommend checking them out first! If you’re in the UK then head to Savvy and Sand. 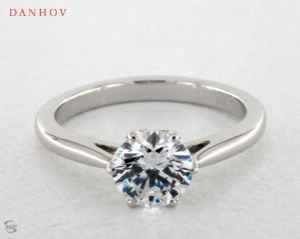 Of course, once you’ve chosen your perfect Danhov setting, you’ll then need to choose and source your diamond. Please contact me directly here for help selecting a diamond or take a look at my Education Pages. Make no mistake, Danhav’s engagement rings are certainly not budget pieces. But the price very much reflects the rings’ high quality and unique designs, and we would say they are very much justified. All Danhov engagement rings are covered by a lifetime manufacturer’s warranty that covers any manufacturing faults or defects. However, it’s worth pointing out that this warranty automatically voids if any repairs or modifications (excluding the setting of the centre stone) are made by anyone other than Danhov themselves. 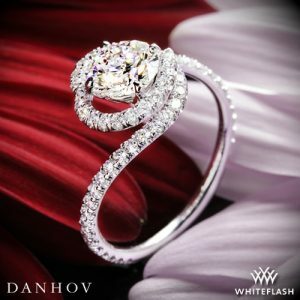 Danhov engagement rings may not be the cheapest on the market, but, if you’re looking for a totally unique, one-of-a kind diamond engagement ring that steps away from traditional designs, then you should definitely consider a Danhov setting.